Pop Up Museum Exhibit, installed inside a 38′ truck. Visitors estimate carbon footprint. Pop Up Museum – A short-term temporary exhibition set-up in a public space, often used to create interest around a topic or used to drive visitors to a full-size exhibition inside of a museum location. Pop-up museum locations include tractor trailers in a parking lot, temporary structures set up in festivals, and malls. Pop up museums are a form of experiential marketing that directly engages museum audience in the museum’s mission, vision and values. Since 2006 I have been part of creating and project managing several pop up museum experiences. Alcatraz” Life on the Rock – traveling exhibition working in partnership with the National Park Service NPS. It has been a great creating pop up museum experiences. There are many similarities between a permanent museum exhibitions and pop up museums although pop up museums can be much more complex than a permanent exhibitions. 1. Evaluation and Market Research – Prior to opening the pop up museum, create a small event to gather feedback and evaluation of your pop up museum ideas. For the Alcatraz: Life on The Rock pop up museum we held two pre view events in the Bay Area to evaluate the exhibition and gather public reaction. The first event was a smaller event, we invited 100 museum professionals and “friends of museums” to an invitation event and used a 20 question survey about the exhibition to better understand the needs and impressions of the pop up museum of potential museum clients. Using the information gathered from the first event we made changes to the pop up museum, changing the layout, installing artifacts and making changes to signage. Then we held a second “event” at the San Mateo County Fair. Over the course of the 10 days at the San Mateo County Fair 120,000 people visited the pop up museum. Having more 10,000 people a day use the pop up museum was invaluable feeback. 3. Make Changes – Now we understood the need’s of museum clients, the general public and had a good understanding of how the exhibition will be used. We made several changes to the exhibition; added exhibition cases, changed graphics, added props, added audio visual effects and added models. I would recommend that people do not spend their entire fabrication budget prior to testing with the public, we are so glad that we had the funds to make changes prior to the premier at Ellis Island. 4. Public Relations – Mr. Robert Luke, a former inmate of Alcatraz Penitentiary graciously offered to be part of the opening at Ellis Island. Mr. Luke now 84 years old, was arrested for bank robbery and was an inmate at Alcatraz. He was at the event October 1st to cut the ribbon and was available for press events. Over the course of the last two weeks more than 20 press organizations have picked up his story and included news of the opening of the exhibition. I have never seen 17-22 year olds so engaged as they were speaking with Mr. Luke, they asked questions, he joked with them and kept them fully engaged for 45 minutes. Make sure that you have a “news worthy story” to accompany your traveling exhibition. Artifacts – People come to see traveling exhibitions to see artifacts. The loan of artifacts is all about relationship building, people are loaning you priceless objects. Build trust with the community of your exhibition topic. Then work to the NPS standards (security hardware, Formaldehyde free wood, silica gel and monitor of case climate, etc. ), transportation of art, loan agreements, insurance and insurance certificates. 5. Layout – Although our exhibition is 3000 square feet, different museums have different sized traveling exhibition spaces. Make sure your exhibition has several configurations with a range of exhibition sizes (i.e. 2500 square ft to 3200 square feet). Truck layout – Design the exhibition to fit into the truck trailer. 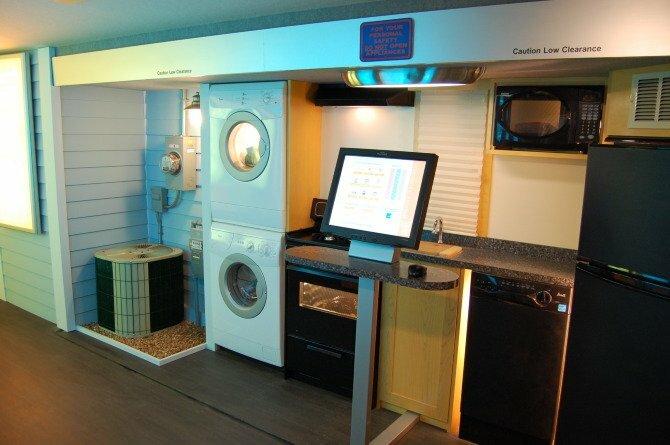 A typical trailer is 53′ long (52’6″ interior dimension), 101″ wide interior dimension and 110″ tall inside the doors. Trailers vary from company to company, but you will want to request a lift-gate, air ride, climate controlled with side doors. Confirm if the company uses trailers with a drop floor? Many trailers do not have life gates requiring a fork life for off loading. 6. Measurements – Walk the path from the truck to the loading dock to the freight elevator to the traveling exhibit space and note all of the dimensions. 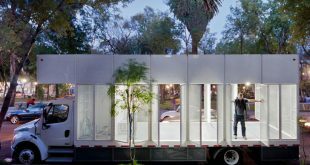 Make sure to do your walk through prior to the move in and load the trailer to accommodate the load in of the exhibition. 7. Crating – Crates are built to protect their contents, they need to withstand the abuse of travel, loading and unloading and be built to take up as little room as possible. Create a numbering system for the exhibition and identify each crate by the exhibition designation. You will be able to stage the crates as you are loading in the exhibition by their number. Often the best protection is an open cradle that can be easily rolled into the traveling exhibition area and unloaded. Create slots to be able to life crates by both the width and length with a pallet jack. 8. Electrical – Once you have established the exhibition layout for the hosting venue, create an exhibition electrical plan. Work with the hosting venue to confirm the amperage, number of circuits and location of electrical. Often you will need to run electrical from a wall or ceiling to the exhibit location. 10. Load In / Load Out – Include in your exhibition budget, dollies (10 or more), pallet jack and a J bar. Be sure to understand how much assistance you will receive from the hosting venue with loading in the the crates. 11. Exhibit Cleaning – Create a place for cleaning supplies within the exhibition, if it is easy to get to cleaning supplies people will be more likely to clean the exhibition. 12. Tools – A well organized tool cart makes all of the difference. Standardize the exhibition hardware using a few different types of fasteners as possible (1/4-20, 3/8″, 1/2″). Set up your tool cart to the different types of hardware. Whenever possible the crate hardware is the same as the casework hardware, helping to simplify the installation. Organize the tool cart with touch up paint and supplies on one side and tools on the other side. Include in the tool cart, extra roto-locks, the exhibition installation manual and spare parts. 13. Photos – Once you have the signed contract for the rental of the exhibition you will want to visit the venue and walk the exhibition “load in”, taking pictures from where the truck will unload to the traveling exhibition gallery. A great help is to photograph the contents of each crate and put a copy of the photo inside of the crate lid. The photo will be very helpful in reloading the crates three months latter. After the artifacts are installed photograph each artifact case and send copies of the photos to the insurance company. If there was ever to be a loss, the insurance copy will already have a copy of all of the installed artifacts. 14. Installation crew– The people that install traveling exhibitions tend to fall into three categories, movers (the people that will load and unload the trucks) Installers (the people that will set up and deinstall the exhibition) and art handlers (the people the will install the artifacts). Depending on the number of artifacts you may also have a registrar to write the condition reports for each artifact. 15. Roto-Locks – Roto-locks are a concealed hardware system for connecting wall panels. They allow walls to ship in cradles (6-10 walls per cradle) with wheels to allow quick set up of walls. 16. Insurance – Unlike a permanently installed exhibition, a traveling exhibition requires an insurance policy for each new venue to cover the exhibition and the artifacts that travel with the exhibition. Each new venue will require an Certificate of Insurance. At each venue the contracted Art Handlers and installers will need to show proof of insurance and sign an agreement that they are not employees of the venue or the sponsors of the exhibition. October 1st the “Alcatraz: Life on the Rock” traveling exhibition opened at Ellis Island. “Alcatraz: Life on the Rock” is a 3000 square foot traveling exhibition created through a partnership of Alcatraz Cruises, LLC (operator of the Alcatraz Island cruise ships) and the National Park Service. I have been working with Alcatraz Cruises as the project manager, to get the exhibition launched.